Loeffler Boiler is the extension of the LaMont boiler. In the LaMont boiler, there was a major difficulty experienced that is the deposition of the salt and the sediment in the inner surface of the water tube through which water flows. This deposition of salt and sediment form a layer in the inner surface area of the water tube that reduces the heat transfer. LaMont boiler also has the overheating problem due to the salt deposition. All these problems of the LaMont boiler have solved by the Loeffler boiler by preventing the flow of water in the boiler tube. It is a high pressure, force circulation of water in the water tube and with an internal furnace. 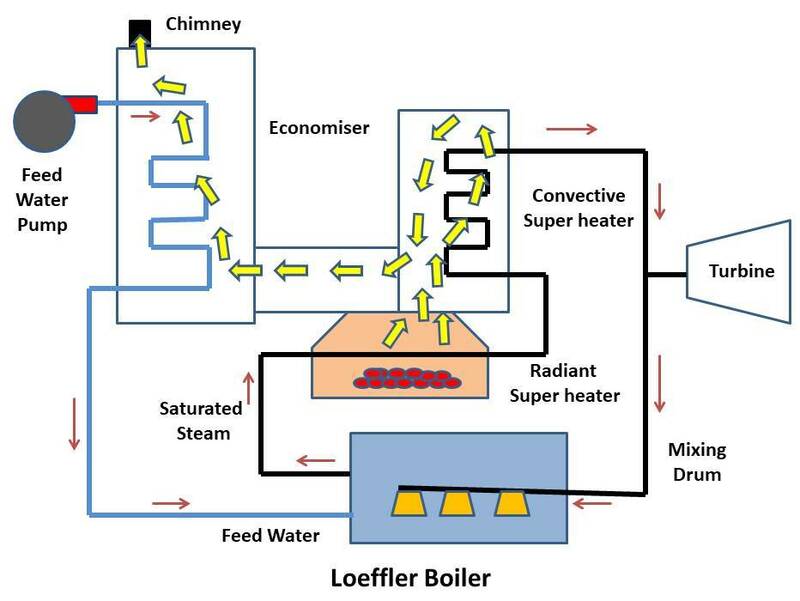 Loeffler Boiler works on the principle that the feed water is evaporated by means of the superheated from the super heater. 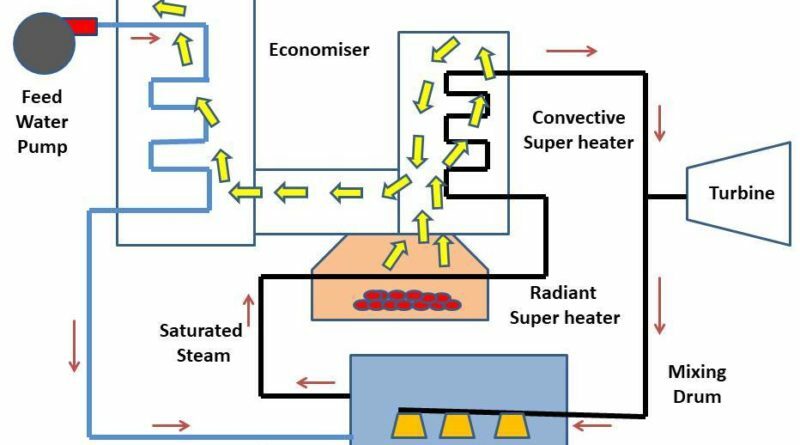 Hot gases are firstly used for the superheating process. Total produce superheated steam is used in two processes. Almost 65 per cent is used to evaporate the water and 35 per cent is used to run the turbine (prime mover). The Loeffler boiler has the capacity to carry high salt concentration due to presence of boiler drum. Economizer is a device which is used basically to increase the efficiency of the boiler. In this boiler economiser is used to preheat the water before it is sent to the drum. The process of preheating of water increases the efficiency of the boiler. The water gauge is provided to indicate the water level in the boiler tank. Water gauge is fitted usually in the front end. When the water is heated up at a high temperature then it converts the water into the steam. When whole tank water converted into the steam, tank gets empty. When the boiler run without water it will produce the steam without the feed water but after some time it leads to great damage such as crack and leak occurs in the boiler parts which get uncovered from the water. The application of the pressure gauge is to measure the pressure exerted inside the closed vessel. It usually mounted on the tip if the shell or drum in which the steam is being stored. 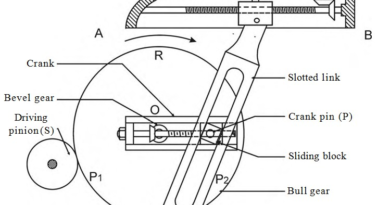 There are two types of pressure gauge is used. Bourdon tube pressure gauge and diaphragm pressure gauge. In the pressure gauge, a pointer is attached to it which rotates over a circular scale and indicates the pressure of the closed vessel. Safety valves are provided to release the excess steam present in the vessel when the pressure of the steam inside the boiler exceeded the prescribed limit. The advantage if this safety valve is there when the pressure exceeds its prescribed limit automatically the pressure valve gets open and the excess steam rush out to the atmosphere and valve automatically closed when the pressure reaches its normal value. A fusible plug is provided to protect the boiler against the against damage due to overheating. This overheating happened due to the low water level in the vessel so proper water level should be maintained to get rid of this problem. Pulverized coal is used as fuel. It is in the powered form supply to the furnace to produce a high amount of heat to heat the water. Pulverised coals are more efficient and produce more heat because of efficient combustion. It provided to the boiler for the exhaust gas. On the burning of coal smoke and the dust particle produces and it released to the atmosphere through the chimney. The drain is provided to the drum where the mixing of the superheated steam and feed water take place. It is open when the scale, mud and sediment form inside the drum. It also opens to release the water when the cleaning is required. It is the surface that heats the preheated water due to convection. This surface itself heated by the flue gases. The super heater is a chamber where the saturated steam is being heated to make it superheated steam. Blow off valve play a very important role in the boiler first is on a prolonged use of the boiler the mud, scale and sediment produced in the boiler. All these impurities have to be blow out periodically for the efficient working of the boiler. It also used to empty the boiler for the cleaning. Feed pump is used to feed the water in the boiler. It is noted that the quantity of feed water should be equal to the evaporation. In some of the Cases injector is used to inject the water into the boiler. Steam main is the path through which the superheated steam is supplied to the turbine to produce the electricity. Normal water is feed into the economizer using feed pump. In the economizer the water is being heated up with the help of flue gases, these gases are produced on the burning of the coal in the furnace. This preheated water drawn into the evaporating drum. This steam is further recalculated by the steam circulation pump and heated by the radiant heater. At this stage the steam reaches to the saturation state. Again this saturated steam is passed through the super heater and steam reaches to the 500degree Celsius. As you can see the drum is provided at the bottom, the drain is attached to it. This superheated steam is supplied to the drum through these five nozzles. When the feed water comes from the economizer then this superheated steam is mixed to it with help of nozzle. Whole drum water gets heated up at a very high temperature to form steam. This steam is further sent to the turbine where the generation of the electricity takes place. Operation of the boiler is salient and clean. High circulation of steam over the tube. Capable of carrying high salt concentration. Loeffler boiler is compact in design. Bubble formation reduces the heat transfer rate. Evaporating drum is used which increase the overall cost and also make it bulky.